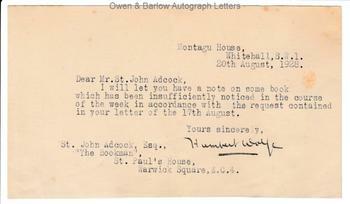 HUMBERT WOLFE Typed Letter Signed. Italian born British poet and man of letters. TLS. 1p. Montague House, Whitehall, SW1. 20th August 1928. To [Arthur] St John Adcock. "I will let you have a note on some book which has been insufficiently noticed in the course of the week in accordance with the request contained in your letter of the 17th August. Yours sincerely, Humbert Wolfe." Oblong 8vo. 10 x 17.5 cms (4x 7 inches). Fine. Arthur St John Adcock was editor of the literary periodical 'The Bookman' and Humbert Wolfe here writes to him in that capacity, presumably promising a book review. 1928 was a productive year for Humbert Wolfe. That year saw the publication of several works, including his verse collections 'This Blind Rose', 'The Silver Cat' and 'Troy' published by Faber in the Ariel poets series.